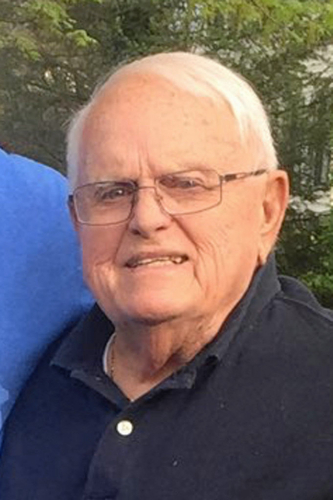 Keith D. Rizzuto, 89, of Schuylkill Haven, passed away Sunday, Jan. 20, at Lancaster General Hospital, Lancaster. Born in Orwigsburg, Oct. 12, 1929, he was a son of the late Matthew and Anna Miller Rizzuto. He was the widower of Jeanne Feeney Rizzuto, to whom he was married 52 years. Keith was a graduate of Orwigsburg High School, Class of 1947. He attended Drexel University and earned a business management certificate from Pennsylvania State University. He served in the Navy, and had worked for Carpenter Technology, Reading, for 35 years, retiring as manager of customer service. Keith was a member of St. Ambrose Roman Catholic Church, Schuylkill Haven. He was also a member of Schuylkill Haven Lions Club, East Ward Social Club and the Robert E. Baker Post 38 American Legion, Schuylkill Haven. Keith was an accomplished musician. He played saxophone in a band during his younger years, and later taught private music lessons in his home. He is survived by three daughters, Kay Ann Brady, wife of Frank, Lancaster, Karen Portko, wife of Larry, Grand Rapids, Mich., and Jane Rizzuto, Lancaster; three grandchildren, Ryan, Janine and Laura; a great-grandson, William. A Mass of Christian Burial will be celebrated at 11 a.m. Thursday, Jan. 24, at St. Ambrose Roman Catholic Church, Schuylkill Haven, with the Rev. Edward S. Zemanik officiating. A viewing will be held from 9:45 to 10:45 a.m. Thursday in the church's chapel. Interment will be private. In lieu of flowers, donations in Keith's memory may be sent to St. Ambrose School, 302 Randel St., Schuylkill Haven, PA 17972, or Lancaster General Health Foundation, 609 N. Cherry St., P.O. Box 3555, Lancaster, PA 17604-3555.